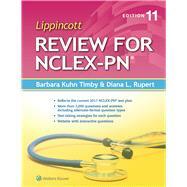 by Timby, Barbara K.; Rupert, Diana L.
Lippincott Review for NCLEX-PN, 11E is designed to help pre-licensure nursing students in practical and vocational nursing programs prepare to take the licensing examination. The book content is divided into comprehensive yet manageable sections. More than 2,000 questions are organized across five major units. The first four units correspond to specialty areas of nursing practice: (1) The Nursing Care of Adults with Medical-Surgical Disorders; (2) The Nursing Care of the Childbearing Family; (3) The Nursing Care of Children; (4) The Nursing Care of Clients with Mental Health Needs. The four major units are further subdivided into a total of 17 separate review tests, with the bulk of the tests aligned with the medical-surgical nursing unit, which is the most common clinical area where new practical nurses are employed. All questions reflect a specific category and subcategory of client need. A fifth unit consists of a two-part Comprehensive Examination containing a total of 263 items. Taken in total, the Comprehensive Examination provides practice with more than the maximum of 205 questions asked on the NCLEX-PN. Another feature is the sections containing the Correct Answers and Rationales and Test Taking Strategies, which follow each review test and comprehensive examination. These sections provide the best answer to each test question; the rationale for the correct answer, and reasons why the other answer choices are incorrect; a test taking strategy to guide the selection of the answer to the question; the Cognitive Level of the question; and the Test Plan Category and Subcategory. Additionally, the book contains a detailed review of Frequently Asked Questions, designed to provide information about the NCLEX-PN testing process, how the test is designed, and suggestions on how to prepare for the examination. The questions align with the National Council of State Boards of Nursing (NCSBN) 2017 PN test plan and are written in the style used on the licensing examination. Other features include the use of all the types of alternate-format questions found on the licensing examination, detailed rationales for both correct and incorrect answers, and information about the NCLEX-PN. This edition contains expanded numbers of alternate-format items and more photos and illustrations, to enhance the learning experience for visual learners. An accompanying free trial of PassPoint PN provides book purchasers an opportunity to practice with additional questions and gives a sneak preview of the full PassPoint PN product.